Security, Texas and New Security, Texas. 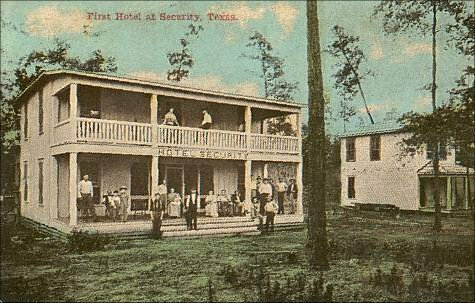 "First Hotel in Security, Texas"
More "Rooms with a Past"
Earliest settlement dates to the 1850s but the town didn�t congeal until the late 1880s when a branch line of the GC&SF connected Conroe to Cleveland. Having a railroad connection allowed for the local forests to be exploited, resulting in a boom around the turn of the century. Although the post office opened as Pocahontas in 1900, it changed to Bennette (honoring the landowner who had owned the property on which the town had formed) in 1902. Mr. Bennette sold out to the Security Land Company in 1907. As if it was a vote of no confidence, the Bennette post office closed that year, but it reopened in 1910 under the name Security. 1914 found Security with most essential businesses (including the hotel in the post card above) as well as a population estimated to be 150. 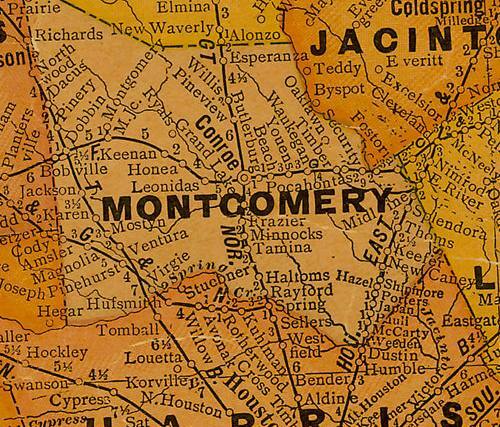 Schools from nearby Timber and White Oak, Texas merged into into the Security common school, which, in turn, merged with Splendora schools in the 1920s. As the timber played out, the lumber mill closed and Security was about to be added to the long list of East Texas timber ghost towns. The remaining 100 residents were informed in the early 1940s that Security would be bypassed by the new Highway 105. The post office remained open until the mid 1950s even after residents had already moved the two miles N to �New� Security. The original Security Cemetery remained in place - within a mile of the old railroad siding. New Security had reported fewer than 30 residents in the 1960s and the 2000 Census reported 24 residents (who may or may not have felt secure about the community�s future).